Happy New Year! Wow it has been a long time since I did an entry here. The store will soon celebrate its two years anniversary. I can hardly believe it, I must I fallen into a rabbit hole... I wish you a great year to come and it's been a pleasure to share my expertise on micro-macrame and knotting thread. I am amazed again and again by the wide range of applications done with the thread I carry. Send jpegs, comments and links for my customers' comment page. The page will be updated soon, so send your anything you wish to post online, pictures and links! Lots of exciting news are in the pipeline: the array of cord and thread carried in this store is growing. 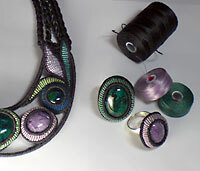 The store will now carry C-lon Bead Thread in Size D as I found it good for micro-macrame. C-Lon has made new color cards for the C-Lon Bead Cords. As it is available in 64 colors, it is very convenient! 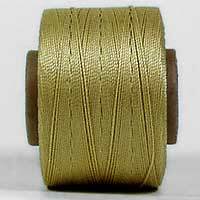 Also just recently I finally found a brand of thread/cord I was searching for a long time, the Tuff Bead Cord Line. It comes in 16 colors, in many sizes. Size 5 is perfect to intermix with the C-Lon Bead Cord/Nylon #18. I can't wait to play with it and have more options. It's here, I just posted all the new pages. Read more above and check it out! Click on picture to enlarge and allow popups. October 31, 2007 - T-pins and needles are available now in the tool section... Happy Halloween! July 31, 2007 - All the C-Lon Color Charts have been updated with the new colors and can be viewed by Colors or Brights/Tones again. Separating the bright colors/hues from the muted tones makes it a lot easier to choose colors. Some comments on the colors are listed when viewing the colors in the Larger Pictures. 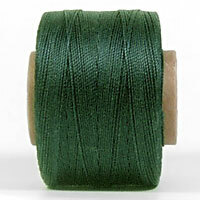 More C-Lon Bead Cord Color Mixes are available. Other: back in stock, Fray Block, 5 minute Epoxy in separate tubes, the Thread Zapper. July 24, 2007 - The C-Lon Sage Micro Cord arrived yesterday, the last of the new 8 colors. All the pre-order have been shipped. I use this kind of thread all the time. Conso #69 is available either in large cones or small bobbins in a limited color range. So the C-Lon Micro Cord is a great addition especially as it matches the colors of its bigger sibling the C-Lon Bead Cord. The Micro Cord is great for stitching, wrapping, finishing, hidden construction, and micro-knotting/macrame with a high count of knots per square inches. It is also a great thread for stringing beads or bead crochet with small holes beads (15/0s, 11/os, semi-precious and precious faceted beads). It can also be used as a a warp or weft thread for loom or for off-loom bead weaving where a twisted thread is desired. July 16, 2007 - The C-Lon Bead Cord Chocolate has just arrived. All the pictures have been redone as it is such a great color and many colors have been moved around the chart once again. This time it looks like it will be this way for a while, so I will get some color chart printed again - J'aime vraiment le Chocolat, it is rich, dark and scrumptious!!! In addition, just back in stock, genuine Gingher Epaulette Embroidery Scissors, Fray Check, and more Kanagawa 1000 Denier Embroidery Silks. July 7, 2007 - New Colors of C-Lon Bead Cord - Medium Purple and Silver are here. Medium Purple is exactly in between Purple & Orchid, Silver is its own color, a light warm grey with touch of lavender and heather. The colors on the jpegs have been adjusted to better match the actual thread. Chocolate & Lavender are on their way. One more color, Sage, to arrive soon. Check out the new color chart. Chocolate, Lavender & Sage will be adjusted when they are here. The full 64 color collection and many other color mixes are now available. Enjoy browsing! June 29, 2007 - Peridot has just arrived. Peridot is misnamed as it is more like the color of New Jade/Soft Green Serpentine, or a new spring leaf. Notice the new sign 'this site is green'. Well for whatever it's worth, Dreamhost, my web server since 2001, has gone green by purchasing green credits for their greenhouse gas releases. I kind of like these guys as they are non-corporate, a little wild, but seem to deliver pretty good service, at least most of the time. Their email support is fast and friendly, delivered in readable English for non-techies like me, if such a word exists. Mainly, they don't play 'advertising games' with their customers. They don't offer short term introductory deals and ignore long term customer loyalty, as many unnamed corporations out there that force us to change service every year to save money or generally behave like sharks whenever they can get away with it. I met Joan at a show a number of year ago. We traded slides for presentation on our work. Her work is exquisite. She has developed her own style with some pieces reminiscent of Tina Johnson-Le Puy. It is 77 pages book published in 2005, 10.8 x 8.3 inches in format bound with staples. Only the outside cover is in color with photos of all ten projects included. The inside is all black & white, but full of diagrams and beautifully illustrated by Jeff Babcock. Lots of work went into these illustrations! 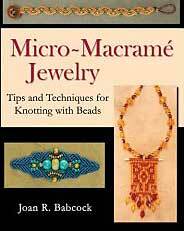 The book includes 10 micro-macramé projects: 4 pairs of earrings, 2 bracelets and 3 neckpieces/necklaces/pendants and 1 brooch/pin or barrette. The instructions appear to be clear and easy to follow even for beginners, but I am not automatically the best judge as I could do the projects without instructions. The book also comprises chapters on materials, knotting tips and the basic knots. All these chapter is well put together. 'The Basic Knots' chapter is very good for beginners and has some good tips for all knotting levels. If you are learning to knot, I usually advise students to use more than one source as one may help with one knot or combination, another with another one. As to 'Materials' for Micro-Macramé', we do not always share the same opinions on basic supplies. For example, I hate sewing pins or quilting pins as I bend them right away, I much prefer 1" T-pins (small ones, not the usual huge ones that come with boards or are sold in most stores) as they hold up to my abuse! The last chapter 'Design Essentials' is full of useful information to help the reader create their own design. So although Joan did not really share the full scope of the design that comprises her current collection, she gives the reader the tools to go beyond the limited scope of the projects included. That chapter alone makes buying this book worthwhile. March 19, 2007 - New additions - Tools - New macramé board from Lacis - Adhesives - Fray Check with comments and tests done so far. February 27, 2007 - New tools added, a thread zapper, new economical scissors and a macrame board. The thread comes on a spool similar to Conso with the cardboard center. The thread gauge is smaller (finer) than the nylon #18 from Beadsmith, Conso and C-Lon Bead Cord, so for the micro knottier more knots per square inches. The slightly thinner thread is great for beads with smaller holes. 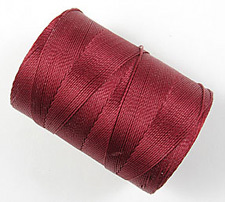 The thread is as smooth as can be, flexible, pliable and it has a beautiful sheen. The thread is very well plied. When you run your fingers down the thread it is very smooth and even. The 4 colors exactly match the Mastex color card if you have one. If you used to work with the Robinson thread, this newly released Mastex is more similar to the Robinson thread rather than the Mastex thread of a year ago. I will wait until a few more colors arrive prior to making a page for the Mastex thread.